100,000 units of Mercedes-Benz’ premium heavy-duty truck sold in the Middle East and in North Africa over the past 20 years. Handover of the milestone truck to customer Messrs. A-Khaldi at the Daimler Commercial Vehicles Regional Center in Dubai. Dubai – Daimler Commercial Vehicles MENA FZE and Mercedes-Benz Trucks have reached a milestone with the sales of the 100,000th Mercedes-Benz Actros in the Middle East and in North Africa (MENA). The celebration of this occasion took place on September 1, 2016 at the Regional Center of Daimler Commercial Vehicles MENA in Jebel Ali, Dubai, where the 100.000th Actros Truck was ceremonially handed over to the customer, Messrs. Al Khaldi from Dammam, Kingdom of Saudi Arabia (KSA). The event was held in the presence of Dr. Wolfgang Bernhard, Member of the Board of Management of Daimler AG and Head of Daimler Trucks and Buses, Sheikh Khaled Juffali representing E.A. Juffali Brothers Saudi Arabia and Roland Schneider, President & CEO of the Daimler Commercial Vehicles Regional Center in Dubai. The Kingdom of Saudi Arabia is the core market in the MENA region for Mercedes-Benz Trucks, with nearly 44,000 Mercedes-Benz Actros Trucks having been delivered since 1997. This result is closely linked to the successful and long lasting business relationship between Daimler and its General Distributor in KSA, Juffali Industrial Products Company (JIPCO). The milestone truck, a 4×2 tractor-head Actros 2041S, is part of a larger 200 unit order by Messrs. Al-Khaldi, who is a long-lasting customer of Mercedes-Benz and JIPCO. 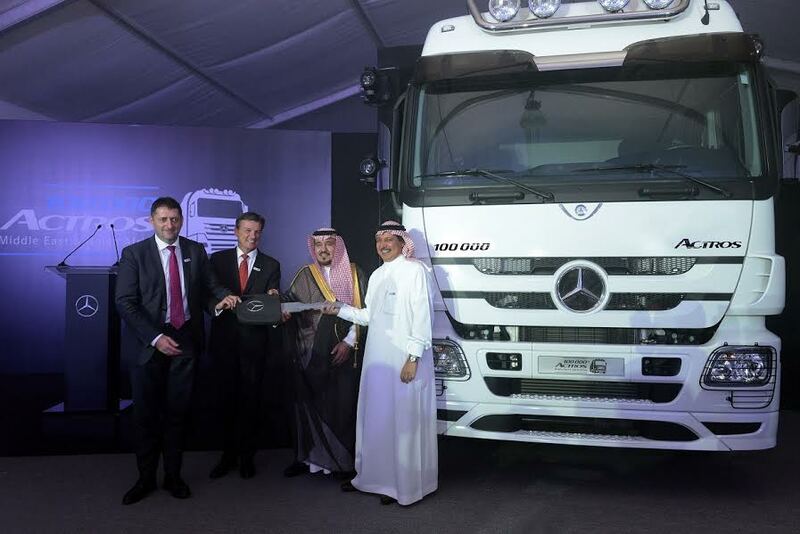 The truck handed over was assembled at National Automobile Industry Company Ltd. (NAI) in Jeddah and is equipped with the Mercedes Powershift automated gearshift and Fleetboard Telematics system enhancing fuel efficiency, as well as Mercedes-Benz Accessories as design elements. Al-Khaldi is a professional organization founded in 1972 by a group of industrial leaders to ensure a high level of professionalism and promote continuing service in the fields of transportation, trading and distribution in KSA. The companies’ main activities are the transportation of petroleum and cement & chemical products distribution, as well as trading of Petroleum Products, Fuel stations and Equipment Leasing. The business relationship between Al-Khaldi and E.A. Juffali & Brothers Saudi Arabia dates back to the 1970’s. A. Juffali & Brothers was established in 1946 by the three brothers Ebrahim, Ali and Ahmed Abdullah Juffali, and became an exclusive agent of Daimler in KSA in 1958. In 1974, E. A. Juffali & Brothers and Daimler decided to establish NAI as a Joint Venture to assemble Mercedes-Benz Trucks in Jeddah, KSA. The first Mercedes-Benz Truck left the assembly plant in 1977, representing a major milestone in the long lasting partnership. JIPCO was established in 2002 to provide Sales, Marketing and After-Sales functions for the Mercedes-Benz range of Commercial Vehicles. JIPCO is the sole distributor of Mercedes-Benz Commercial Vehicles in the Kingdom of Saudi Arabia. The Actros has been the flagship model in the product range of Mercedes-Benz Trucks since its production start in 1996 – and it still is in the year of its 20th anniversary. Economical, dynamic, versatile and comfortable – with these characteristics the Actros has become the most successful heavy-duty truck in the world. The Mercedes-Benz Actros is highly fuel efficient and enjoys a reputation for supreme power, reliability and safety since many years – in the Middle East, North Africa and all over the world. With an unreached level of quality, the Actros is the truck to trust, even after hundreds of thousands of kilometers in operation under the harshest and most challenging conditions.